Liar. Linda, you're lying. 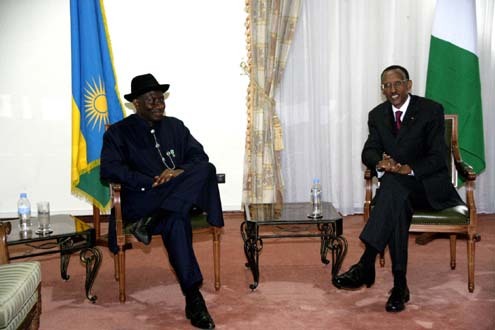 The president is not in Kigali, Rwanda. He's in a beer parlour somewhere in Port Harcourt, Nigeria. Both men look drunk - power drunk. Okay.... so he now left Patience to finish the whole country with her grammar! What is he doing there? No more fuel subsidy..coming soon! He has said. 'Your' President abi 'Our' President? You will say our president. Mrs Linda? Not Your President. Whatever he is doing there? Lol! Linda u r so funny. But wetin this prezido dey do in Rawanda? We have issues to fix in Naija. Thanks for letting us know, atleast he must be doing something about this them bokos. let him be travelling around, fool. he has not started anything and he is travelling. what do yu menlan by "YOUR PRESIDENT?" This Man na real Puddycat i swear! I hope he at least learns from the past of those people. It would be sad if he doesn't get a take home message because we have some sort of ethnic/religious cleansing going on in the north and in Jos, but not to the scale of that of Rwanda's. God bless the president of the Federal Republic of Nigeria. Why should he put on a suit? We should learn from other countries like India. They look inwards for everything. Maybe he went to beg Kigame to release some Hutus to help him 'genocide' boko haram. Linda that's rude u know! Chuddy K collaborating with Bruno Mars?